Note that this guide is intended for Node.js users. If you are using a different language/server for your backend application check out the Generating HTML Snippets guide instead. Bundle manifest files give you the information needed to know which <script> and <link> tags are needed for each bundle in your application. This guide will go through setting up a basic Express server, and using steal-bundle-manifest to attach the correct HTML needed, as well as provide Link; rel=preload headers (which will inform the browser to start loading the assets early). Create the following server.js file in the root of the project. For now it is just a skeleton, later we'll update it to include a template (using template strings) to send the HTML for each route. var plugin = typeof moduleOrPlugin === "function"
Uses manifest.for() to get a bundle object. Filters on bundle.assets to divide the assets between scripts and styles. Passes these arrays into bundle.toHTML() to generate snippets of HTML, injected into the template literal. 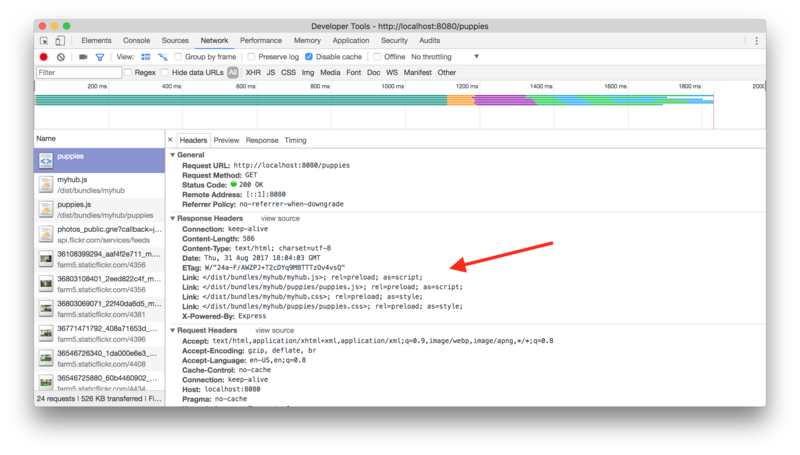 Uses bundle.push() to add the relevant Link headers. Notice that there are Link headers for each of the assets on the page. And then use them in your template directly. This example is in Handlebars/Mustache.